So after the catching up, the commercial patterns, the vintage patterns & the founding of my very own little Etsy shop (which has new goodies, btw)……… Back to something this blog was started for – Patterncutting!!! Anyway, I digress. Daughter No2 wanted to start with skirts. Pencil skirts & wiggle skirts. I posted some sketches I’d done, & she’d approved a couple of posts ago. I have done the patterns for two of them, and made one of the skirts in between getting sidetracked & distracted by other shiny new things! 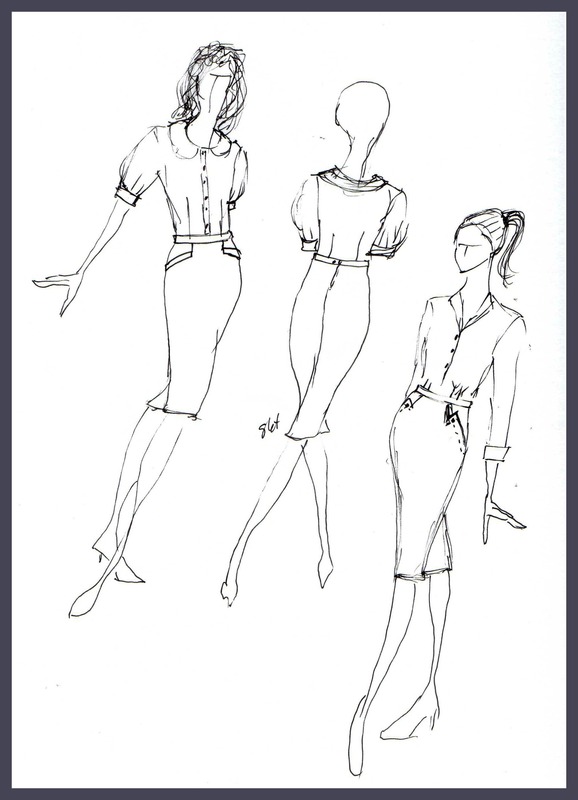 So what we are after are simple pencil skirt shapes, with detail. These two focus on the pockets. I’d seen some patterns on Pinterest & Etsy, unfortunately either the wrong size, or already sold, and we decided to see if I could run them up! We started with the one on the left, which Daughter No2 has called the Barbara skirt. I used the dart (moved over towards the centre front a bit) as the starting point for the pocket, which also ended up being more curved than the initial sketch. The skirt is pegged at the hem, I took in 2.5cm on each side seam & the same at the back. Initially I was going to put a vent or slit at the back to enable walking, but after the toile she decided she didn’t need/want one this time. How cool would it look with a little godet though?? 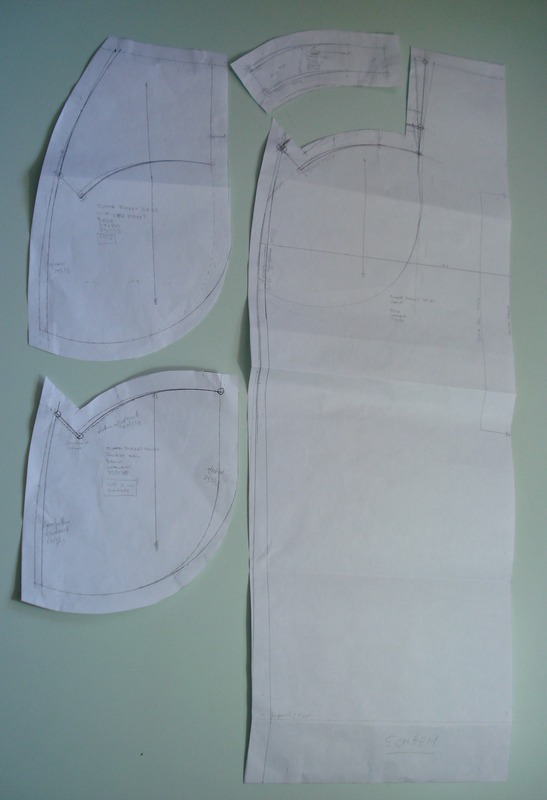 These are the working pattern pieces for the skirt, you can see my adjustments & alterations scribbled all over them. Once I am happy with the look, fit etc, I trace these off with the required markings so I can see what’s going on, but I always keep the working patterns to keep track of my fiddling! 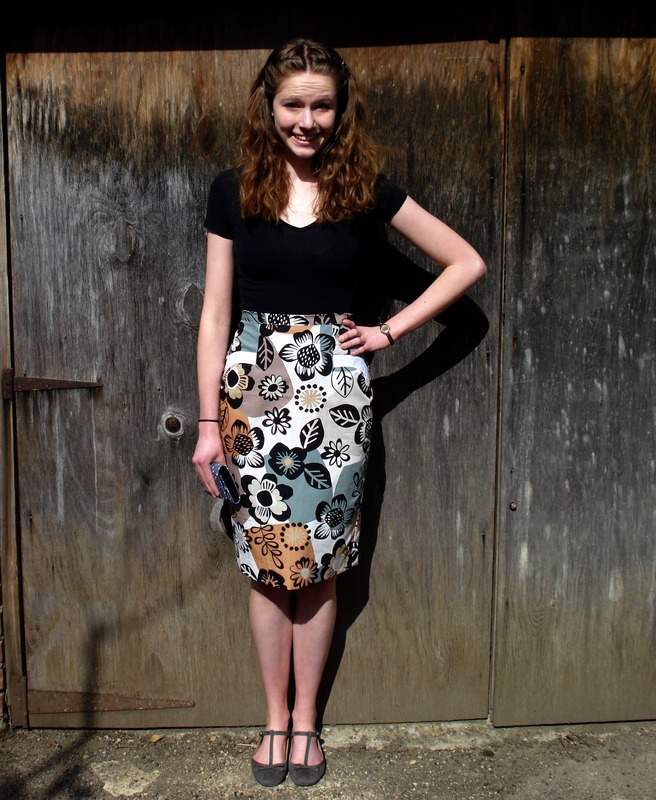 The skirt sits properly on the waist, with a straight, narrow waistband. The fabric is a mid-mod inspired print by John Kaldor in cotton with the teeniest amount of stretch. I bought this aaaages ago, and made a skirt for myself, but had quite a bit leftover! I decided a contrast pocket band would look good, but didn’t have a piece of black in a suitable weight cotton to match, so went with white. The just-above-the-knee length works quite well. The proper 50’s length would have definitely necessitated a walking vent, but Daughter No2 didn’t want it that long. That is just lovely. Ever thought of releasing your patterns to a willing and paying public?! I’d be first in the queue with my cheque book! Bless you, that’s sweet! Honestly, I wouldn’t have a clue where to start with all that, but I am happy do do a tutorial, if you have a skirt block that fits you…. Thanks for sharing your drafting concept. Brilliant skirt. Thanks Tia, I can see this in many fabrics for the autumn & winter. Superfantastic skirt! Looks terrific on her and love the pockets. I think everything I make now, has to have pockets. Oh, pockets are a must! iPods, loose change,etc all need a little home! So clever of you – and it looks fabulous on her! Previous Previous post: Breaking News…..